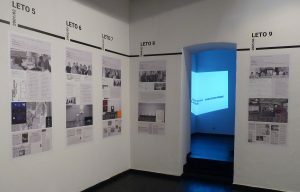 The exhibition was prepared and realized with the help of the participants of the World of Art School, Year 16: Urška Aplinc, Živa Brglez, Maja Burja, Anabel Karolyn Černohorski, Magdalena Germek, Anja Guid, Nika Ham, Ajda Ana Kocutar, Iza Pevec, Adrijan Praznik, Nina Tepeš. You are kindly invited to attend the opening of the exhibition re-, an exhibition on the occasion of the twentieth anniversary of the World of Art, School for Curatorial Practices and Critical Writing, on Tuesday, 9 May, at 8 pm in Škuc Gallery. 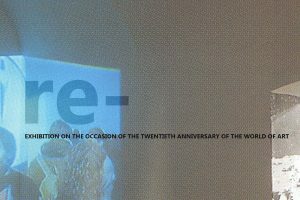 With the exhibition re-, World of art, School for Curatorial Practices and Critical Writing, marks the twentieth anniversary of its existence. Through this presentation of its archive, it offers various points of entry for re-contextualising and re-interpreting the collected materials, which can serve as the basis for an analysis of the relations between the actual and the symbolic position of World of Art, and also for a reflection on the broader art system. The exhibition situates the material and the artworks in different temporally scattered relations while their juxtaposition is meant to encourage a consideration of their content-related and material nodes. The issues highlighted in the exhibition form an interpretive discourse which, at the level of layout, shapes and flows into various points of entry. Within the current cultural context, these points are determined by the spatial and temporal tracing of changes in modes of operation and by a reflection on the establishment of specific social roles, forms and contents of social relations. The first room presents the twenty years of history of the school with a timeline and it introduces visitors to the shifts in the programmes and development of the school and its external reflection. The content in individual sets reflects the development of the discursive foundations and determinants of the programme’s operation. The juxtaposition of various materials makes possible an intertextual reading of the archive, while the materials thus become part of the thematic and conceptual continuity as well as part of the issues that stem from constructing methodologies in the former, current and future functioning of both World of Art and the system it belongs to. The restaging of the work Present Situation by Rene Rusjan from the first World of Art exhibition in 1997 (This Art Is Recycled) in the same gallery space can be interpreted as a re-production of the artist’s principle of recycling, whereas critical effects of this work are also manifest in the shifting of attention to the processes of “constant temporariness” in the conditions of hyperproduction. Video interviews in the third room articulate important distinctions in the register of personal and broader changes in the system. Namely, in their statements, the former participants problematise the modes and conditions of being active in the field of curatorship and in the broader social context. Blaž Miklavčič’s work Orientation Scheme, which is based on interviews, opens up a neuralgic point in the analysis of the institutional meshes of the system in the circuits of the exhibition. 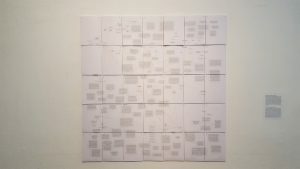 In its “unfinished” state, the scheme maps the key factors and processes within the art system and combines them, through algorithmic fragments, into partial narrative schemes. Orientation Scheme highlights a number of situations formed by the cluster of the stated, whereas its defragmentation leaves space for detecting problems in the institutional meshes. The peculiar politics of “small gesture” within a local context enables us to read statements which are often marginalised due to the maintenance of the consensual “harmony” of the system. An important part of the school’s educational continuity is presented with a timeline in the fourth room, which includes materials from workshops, seminars and lectures which contributed importantly to the development of theoretical discourse and to the greater flexibility in liaising within local and international contexts. As an informal education programme in the field of curatorial practices and critical writing, the school World of Art has opened up a space for specific production and distribution of knowledge. Within a homogenised public sphere, production always requires space for changes in the modes and possibilities of participation, while the implementation of such changes is only possible by creating new intersections of people and knowledge. Within the current micro- and macrocultural models, the need for different production of knowledge manifests itself in the intensification of emancipatory practices of education in the field of art. However, in the times of ever more complex social relations and phenomena, the strategies of liaising and acting call for reflection on the re-construction and/or transformation of modes of acting within the entire art system. The World of Art School started in 1996/97, at the same time as some other formal and informal international education programmes. It was conceived as a series of lectures on contemporary art and as a course running over several months, which made it possible for the participants to conceive and under the mentorship prepare an exhibition of contemporary art. Ever since its inception, the school, the successor to the course, has been characterised by its flexibility and responsiveness to the needs of each particular generation. Through a series of transformations, combinations with the seminar in writing and the gradual addition of contents, the school has been outgrowing its former framework and it is now called World of Art, School for Curatorial Practices and Critical Writing. The prefix re-, which acts as the title of this exhibition, may originally denote a return to the past, but, at the same time, it also connotes encompassing and transforming everything that is a matter of the past into a matter of the future. Guided tour of the exhibition on Wednesday, 24 May, at 6 pm. Sponsor: Apcom, d. o. o.